Sometimes a room that has no windows needs to be cooled and many look to portable air conditioner to help them. Keep in mind that extending the existing HVAC system is usually the best long term solution. For those looking for a portable units they come two in main categories, evaporative coolers and portable units that have a small hose to feed outside. Evaporative coolers work when the air is dry and doesn’t have high humidity in the air. For this reason they are mostly used in arid climates such as the American South West. They work from evapration, such as when getting out of a pool on a hot day and a wind blows it help to cool a person down. Water is fed though pads that a fan blows air though and cools the air as it passes through. 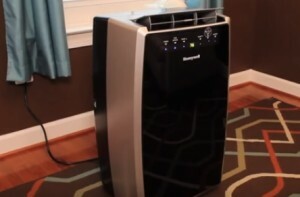 If you live in a arid dry climate than a evaporative cooler will work nicely. If you live in a region that has a lot of humidity than much less so if at all. Another option is a portable air conditioner that uses a small hose to pump out hot air from a room. While this option still requires an opening at some location much less so than a large window air conditioning unit. The hose can often be modified in a variety of ways to let the hot air be pumped out of a room. For example a door can be draped with a blanket and opened slightly to let the hot air out, or the hose run to another room that does have a window. Every situation will be different depending on the climate and how the room is built into a building so lets look at some popular portable units. The Honeywell MN12CES uses a hose to pump out hot air from a room. The hose is 5 inches in diameter but is flexible and can be squeezed if necessary for a wider fit in tight spots. While this type of portable unit does need a opening at some location to pump out hot air it will work in any climate type. Since it is a air conditioner it works in humid or dry climates. This cooling unit from SPT requires no windows or other outlets. It is a evaporative unit which work well in dry climates with little to no humidity. If you live in a humid climate than it is best to look at a air conditioner style unit. For those that do live in a dry climate than evaporative units also called swamp coolers work well. They are also cheaper to buy and run since no heavy compressors is used. The Luma Comfort EC110S is another evaporative unit. It is more stylish than other units and has many added features such as three speed fan control and programmable timer. As with any evaporative unit it only works well in a dry climate. Trying to cool a room with no windows is always a challenge and the best unit to use always changes from scenario to scenario. If a more long term options is needed than other type units such as mini split units which are air conditioners that split the components apart, and use a small hole to feed in a line to run in and out hot or cold air. Mini split units cost more to buy and install but are long term solutions. Hopefully one of the above type of units work for your situation and keep your room cool. As always be sure to read the reviews on Amazon or elsewhere to be sure a unit is the right fit for you.